… a major international initiative to examine how countries can achieve economic growth while dealing with the risks posed by climate change. The Commission comprises former heads of government and finance ministers and leaders in the fields of economics and business, and was commissioned by seven countries – Colombia, Ethiopia, Indonesia, Norway, South Korea, Sweden and the United Kingdom – as an independent initiative to report to the international community. In this post I will briefly look at Figure 1 from the report, re-posted by Ben Pile. Figure 2 : From Goklany 2010 – Global Death and Death Rates Due to Extreme Weather Events, 1900–2008. Source: Goklany (2009), based on EM-DAT (2009), McEvedy and Jones (1978), and WRI (2009). Note that The International Disaster Database is EM-DAT. The website is here to check. Clearly these show two very different pictures of events. The climate consensus (or climate alarmist) position is that climate change is getting much worse. The climate sceptic (or climate denier) position is that is that human-caused climate change is somewhat exaggerated. Is one side outright lying, or is their some truth in both sides? Indur Goklany recognizes the issue in his report. His Figure 2, I reproduce as figure 3. Figure 3: Average Number of Extreme Weather Events per Year by Decade, 1900–2008. Source: Goklany (2009), based on EM-DAT (2009). The updated figures through to 2016 show that pro rata, in the current decade occurrences if climate-related events as similar to the last decade. If one is concerned about the human impacts, deaths are more relevant. This shows unprecedented flood deaths in the 1930s. 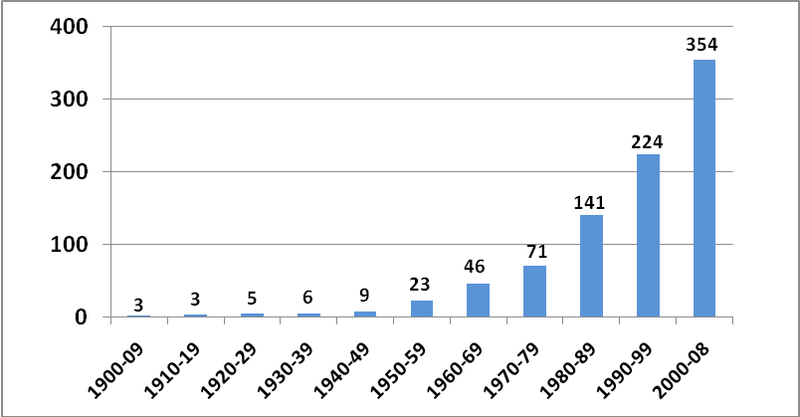 Of the 163218 flood deaths in 6 occurrences, 142000 were due to a flood in China in 1935. Wikipedia’s Ten deadliest natural disasters since 1900 lists at No.8 1935 Yangtze river flood, with 145000 dead. At No.1 is 1931 China floods with 1-4 million deaths. EM-DAT has not registered this disaster. 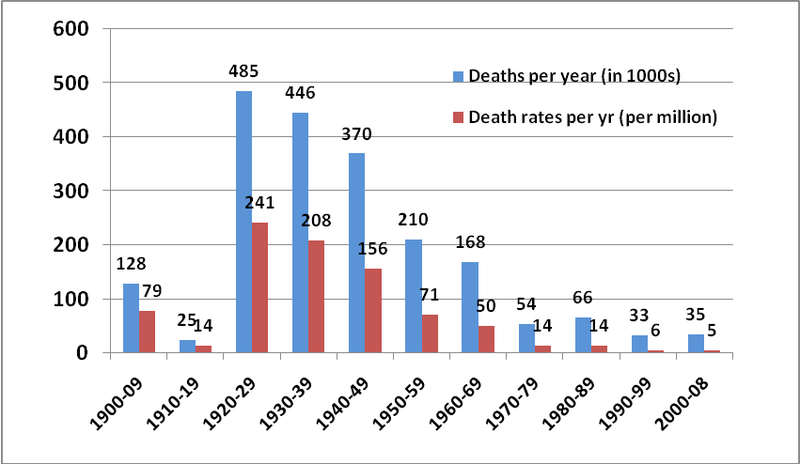 The decade 1970-1979 was extreme for deaths from storms. 300000 deaths were due to a Bangladesh storm in 1970. Wikipedia’s Ten deadliest natural disasters since 1900 lists at No.2 1970 Bhola cyclone, with ≥500,000. The decade 1990-1999 had a high flood death toll. Bangladesh 1991 stands out with 138987 dead. Wikipedia No.10 is 1991 Bangladesh cyclone with 138866 dead. In the decade 2000-2009 EM-DAT records the Myanmar Storm of 2008 with 138366 dead. If Wikipedia had a top 11 deadliest natural disasters since 1900, then Cyclone Nargis of 2 May 2008 could have made the list. From the BBC, with 200000 estimated dead, it would have qualified. But from the Red Cross 84500 Cyclone Nargis may have not made the top 20. This leaves a clear issue of data. The International Disaster Database will accept occurrences of disasters according to clear criteria. For the past 20-30 years disasters have been clearly recorded. The build-up of a tropical cylone / hurricane is monitored by satellites and film crews are on hand to televise across the world pictures of damaged buildings, dead bodies, and victims lamenting the loss of homes. As I write Hurricane Florence is about to pound the Carolinas, and evacuations have been ordered. The Bhola Cyclone of 1970 was no doubt more ferocious and impacted on a far greater number of people. But the primary reason for the extreme deaths in 1970 Bangladesh was lack of warning and a lack of evacuation places. Even in the Wizard of Oz, based on 1930s United States, in a Tornado most families had a storm cellar. In the extreme poverty of 1970 Bangladesh there was nothing. Now, after decades of moderate growth and some rudimentary warning systems, it is unlikely that a similar storm would cause even a tenth of the death toll. Even more significant, is that even if (as I hope) Hurricane Florence causes no deaths and limited property damage, it will be sufficiently documented to qualify for an entry on the International Disaster Database. But the quality of evidence for the 1931 China Floods, occurring in a civil war between the Communists and the Kuomintang forces, would be insufficient to qualify for entry. This is why one must be circumspect in interpreting this sort of data over periods when the quality and availability of data varies significantly. The issue I have is not with EM-DAT, but those who misinterpret the data for an ideological purpose. How did you manage to register. I tried, and it rejected my email as “private” and demanded to know what company I worked for!! Why not, it is obviously crap with so much missing data, the data prior to the seventies is obviously missing in action. Tornadoes, Typhoons, Floods (as you said about China) , Wild Fires and Droughts are all missing, you only need to go on wiki or Tony Heller’s forum to see for yourself. All the items are present in the database. The problem is that until the late 1980s only reported extreme events were recorded. So a flood that killed hundreds of thousands in China in the 1920s would have been reported, whilst one that killed hundreds would not. Since 1990 any flood that kills a few dozen will be recorded, as would floods with no deaths but substantial property damage. What the database clearly shows is that deaths from extreme events (weather / earthquakes / famine / etc.) have fallen massively compared to 1900-1950. It will understate this fall. Anyone who looks at frequency of events without reading the documentation is not very bright, or is deceiving people. Thanks for pointing this out. I think in numbers and proportions, not in words. I am calling BS because it seems the graphs for not show the data in the same way. Why are there different splits of time period? Why for example are droughts shown from 1984 but temperature events from 1996? And why present the data in this way anyway? Why not annual bars showing events each year? Maybe it is because it would look different? To keep it simple, but consistent, I would use decades. Problem is that this would emphasize the consistency in increase as due to standardized reporting of disasters came into play across the world. Thanks for the response, it shows again, it is not raw data but how it presented that can be deceptive.